Black holes are the rock stars of cosmology. With the possible exception of the Big Bang, nothing gets better press. 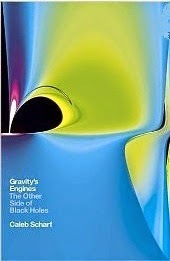 And there has been plenty written about the guts of black holes – but in Gravity’s Engines, Caleb Scharf turns the picture on its head and explores the interaction of black holes with the environment around them. The result is stunning. I can’t remember when I last read a popular science book where I learned as much I hadn’t come across before. In particular Scharf’s descriptions of the super-massive black holes in the centres of galaxies and how they influence the formation and structure of the galaxies is truly fascinating. What’s more, this is no workmanlike bit of dull scientist droning, like some books by astronomers. Scharf can wax lyrical when taking us on a journey through space. I particularly loved the cosmic zoom fairly early on in the book, where he follows X-ray photons from a distant galaxy 12 billion light years away, very cleverly linking their flight to events on Earth (once it had formed around 4.5 billion years ago) that were happening at the same time. The book is not without problems. Often the description is great, but sometimes it tips over into the flowery. It’s difficult not to lose interest a bit when Scharf goes into the details of his own work in a lengthy section. The attempt to show that black holes are somehow responsible for life on Earth stretches the credulity. And worst of all, Scharf never admits how much of what’s in the book is speculative, stating almost all of it as if it were unquestioned fact. So, for instance, dark matter is taken for granted with nary a mention of the competing MOND theory. I don’t think scientists (especially cosmologists) do themselves any favours when they pretend they deal in absolute facts. This doesn’t detract though from the reality that this is the best cosmology book I’ve read all year, and a must for anyone with an interest in black holes. Recommended.